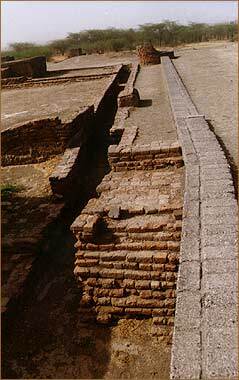 The most unique aspect of planning during the Indus Valley civilization was the system of underground drainage. The main sewer, 1.5 meters deep and 91 cm across, connected to many north-south and east-west sewers. It was made from bricks smoothened and joined together seamlessly. The expert masonry kept the sewer watertight. Drops at regular intervals acted like an automatic cleaning device. A wooden screen at the end of the drains held back solid wastes. Liquids entered a cess poll made of radial bricks. Tunnels carried the waste liquids to the main channel connecting the dockyard with the river estuary. Commoner houses had baths and drains that emptied into underground soakage jars.